In the run-up to the Eastern Partnership Summit in Vilnius on November 28th, the presidents of Armenia and Azerbaijan met in an attempt to restart negotiations over the ongoing Nagorno-Karabakh conflict. Although the war between Armenia and Azerbaijan officially ceased over twenty years ago, current tensions between the two states serve as the main impediment to resolving various regional issues, including growing freshwater scarcity in the South Caucasus. Pressures on water quantity and quality in the region are still moderate. However, anthropogenic and climate-induced reductions in water supply, coupled with instability within the social and economic systems, are likely to lead to a worsening of interstate relations, and could exacerbate current tensions in this volatile region. But this reality also reveals an opportunity for conflict-resolution. Shared natural resources imply possible mutual benefits of cooperation between states. In particular, cooperation over water resources offers an opportunity for building trust. This will not be easy. A significant lack of trust and technical know-how in the region, as well as an asymmetry in resources available for environmental protection, are main obstacles to cooperation. That is why an engaged international community, particularly the European Union (EU), will be critical. Positioned between the Black and Caspian seas, the South Caucasus is comprised of three countries – Armenia, Azerbaijan, and Georgia. These states share many similar characteristics, shaped by an array of ethno-territorial conflicts and faulty governments. The region reverted to increased authoritarian rule due to the pressures from war, threats of economic collapse, and inexperience with participatory politics. Situated at the intersection of energy and transport lines, the region is also in the midst of a contest for energy resources in the Caspian. The region’s economic, political, and security dynamics are closely tied to its hydropolitics as state borders create artificial barriers for regional ecological processes. The Kura-Aras River Basin is the largest in the South Caucasus, and its water resources underpin the development of all sectors of the economy. 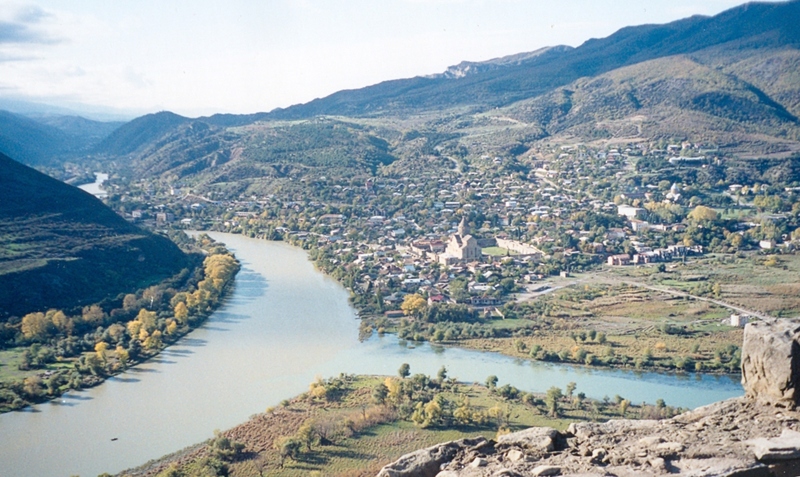 Freshwater shortages are characteristic of the South Caucasus. Additionally, the quality of water in the Kura and Aras Rivers is low due to pollution. Furthermore, impractical water management and unsustainable water use patterns are prevalent across the basin and pose a serious threat to the economies of the riparian states. Population growth and rapid economic development of the basin countries create an additional burden on its freshwater resources. Added to these existing challenges is climate change – one of the main factors which stands to influence water availability in the basin for future uses. In light of the conflict between Armenia and Azerbaijan, any trans-boundary problem between the two states becomes politicized. Azerbaijan’s grievances towards Armenia mainly center on pollution and reduction in stream flow. In 2011 the government of Azerbaijan went as far as accusing Armenia of deliberately polluting the rivers that rise in the Armenian territory and flow into Azerbaijan. The peace process between Armenia and Azerbaijan stalled in 2011. Inflammatory rhetoric and provocative gestures, directed towards inciting inter-ethnic feelings, can be seen from both sides. While Azerbaijan is promising to regain lost territories using a military solution, the Armenian side is considering preventive strikes. A recent International Crisis Group report points to heightened sensitivity and chances for a serious escalation by the end of 2013. Azerbaijan is shifting the regional military balance in its favor by spending more on its military than Armenia’s entire national budget, thanks to energy export revenues. Armenia has not been able to keep up due to a lagging economy and isolation by Azerbaijan and Turkey. However, Russia has been serving as the guarantor of Armenia’s security in a hostile environment since 1991, mainly by supplying arms at a discount and maintaining a military base in the country. Though Azerbaijan has flourished thanks to rich hydrocarbon reserves, which increased its government budget almost 20-fold over the last 10 years, it is less-fortunate when it comes to water resources. In comparison to the upstream riparian states, Azerbaijan has a limited water supply. This inequity plays a significant role in the hydropolitics of the region. The streams of Kura and Aras flow into the Caspian after joining in Azerbaijan, and are the primary source for Azerbaijan’s water. As a downstream country, the majority of Azerbaijan’s water resources forms in the territory of Armenia and Georgia, severely limiting supply by the time it reaches its territories. Additionally, the water arrives in a heavily polluted state. Contamination with waste water exceeds sanitary norms, leading to waterborne diseases and causing significant public health concerns. Climate change is expected to further exacerbate the availability of fresh water supplies in Azerbaijan. With average rainfall amounts decreasing, global warming is likely to accelerate the desertification process in the semi-arid Azerbaijan. Potential scenarios project an increase in area of arid territories by 25-30% and a 15-20% decrease in water resources by 2050. Recognizing the scale of the problem, improving the management of water resources and reducing degradation of the basin have been on Azerbaijan’s agenda for some time. Azerbaijan’s government has been reaching out to the international community for help with enhancing local capacity and regional cooperation. Certain successes have been achieved already. Azerbaijan and Georgia, aided by UNECE, are in preparations to sign an important interstate agreement. A first of its kind in the region, the agreement aims to govern usage of the Kura River water resources through trans-boundary cooperation. But more work is needed to reach a sustainable solution. The effect of climate change on overall economic development in the South Caucasus may lead to increased tensions in local as well as regional politics. Climate-related economic losses from natural disasters or slower-onset phenomena are expected. Climate change may already be playing a role in the South Caucasus, as shown by increased intensity of droughts and flooding. A 2011 study on climate change and adaptation noted temperature increases and forecasts a dryer and warmer region (up to 5°C) by the end of this century. Although higher temperatures have not yet led to falls in precipitation and increased evaporation rates, water supply in the Kura-Aras Basin is expected to decrease significantly. Reductions in water supply will, in turn, coincide with an increase in demand for water because of hotter, drier conditions. Additionally, if the intensive reduction of glacier surfaces in the Caucasus Mountains continues at the same rate, it may lead to problems with fresh water supply while further increasing the risk of floods. The impact of agricultural run-off may also be exacerbated by climate change by way of volatile precipitation and overflow of rivers. Adaptation measures include investment in water infrastructure in anticipation of natural disasters, and preparation of the agricultural sector for possible climate risks. Anti-flood infrastructure in the basin of the Kura and Aras rivers has become obsolete, and the necessary construction and operation of anti-flood installations is out of reach for financial reasons. Although the frequency of floods has been reduced by the construction of a number of dams and water reservoirs on the Kura and Aras Rivers, the absence of water reservoirs with flood absorption capacities, as well as lack of integrated control of floods, are seen as the main underlying reasons for continuing floods in the basin. The prohibitive costs of updating agricultural infrastructure during the transition from collective state to privately-owned farms, resulted in inefficient irrigation and drainage systems, which increase the demand for water. Given the forecasted reduction in water resources and increased need for irrigation, modernizing agricultural infrastructure, such as the use of advanced micro-irrigation technologies, is necessary in order to increase the effectiveness of existing irrigation perimeters without jeopardizing the availability of water. Other adaptation measures include conservation and an increase of water storage capacity in order to ameliorate water shortages during periods of high demand. All these measures require a significant investment into agricultural research, and consultative services from national governments and the international community. Although climate change stands to damage the further development of the region, addressing other anthropogenic actions may help avoid its aggravation. Degradation of transboundary ecosystems has been observed along the whole basin, including an increase in biodiversity loss, deforestation, and soil degradation. Water pollution is a contributing factor in the deterioration of the environment, and increased pressure on an already overburdened ecosystem. Chemical substances of anthropogenic origin enter the trans-boundary basin of the Kura River from various surface springs. Having become constant components of the water, polluting substances pose a real threat to the region’s ecosystem. Since the basin contains high population density, the health of millions living in the region is in danger by way of exposure to water-borne diseases. Although economic development in the South Caucasus has soared in recent years, it has mostly been confined to a small number of areas, particularly the capitals. The vast majority of the population in the three countries is still employed in the agricultural sector. With irrigated agriculture being the dominant user of water resources in the South Caucasus, fertilizer and pesticides tend to be the main sources of pollution of surface water with organic compounds of nitrogen and phosphorus. The largest negative impact is observed during snowmelt in early spring, when nitrates and phosphates used the previous fall are washed out of the soil. Excess nitrogen and phosphorus in surface waters cause excess algae growth and health problems in both humans and livestock. Furthermore, irrigation must be matched by drainage to protect soil structure. However, inadequate drainage collector systems degrade river quality, leading to an increase in soil salination. Much of the region’s municipal and industrial wastewater, as well as agricultural run-off, flow directly into the basin’s surface waters. The region is lacking in the infrastructure necessary for the establishment of basic sanitary and hygienic conditions in the water. Sewage systems only cover part of the region’s territory – mostly major cities, with sewage systems in rural areas rarely in place. The majority of the water treatment facilities were built 20-30 years ago and are currently obsolete, or in poor condition, due to improper maintenance. Only a few treatment facilities are functioning. Generally, industrial and household wastes are released into the same sewage systems. Heavy metals enter the basin waters from extractive, metallurgical and chemical enterprises as a result of the flooding of contaminated industrial territories located along the banks during overflow of rivers. The unsustainable use of natural resources, due to a high poverty level and a desire for immediate economic gain, threatens the existence of natural ecosystems and future economic growth. The region is faced with the problem of desertification, which is inseparably linked with soil erosion, salination, and an overall degradation of the land. Urban development and irrigated agriculture lead to intensive deforestation and degradation of natural floodplains. Deforestation, in turn, contributes to soil degradation. Such anthropogenic interference also increases the risk of floods and mudflows in countries located downstream of the rivers. Although floods and mudflows are encountered throughout the territory of the basin, the country most frequently subject to both is Azerbaijan. Neighboring countries are undoubtedly playing a role in the conflict between Armenia and Azerbaijan by exploiting and inflaming tensions, thereby stalling any advancement towards a necessary regional agreement on usage and protection of transboundary water resources. Russia’s support of Armenia is countered by Georgia’s and Turkey’s support for Azerbaijan. Armenia’s provision of space for Russia in the South Caucasus counters Azerbaijan’s and Georgia’s cooperation with NATO. Furthermore, Israel is one of Azerbaijan’s top trading partners, which makes another neighboring country – Iran, extremely uncomfortable. Israel supplies arms to Azerbaijan, while Azerbaijan serves as the top provider of Israel’s oil. Iran supplies Armenia with gas in exchange for electricity and has had historically good relations with Armenia. The Nagorno-Karabakh conflict is pushing Armenia closer to Russia and impeding Armenia’s closer ties to the EU. Armenia’s recent decision to join the Eurasian Customs Union of Russia, Kazakhstan and Belarus, rather than signing an Association Agreement through the EU’s Eastern Partnership, reflects its main concerns – security and energy. Armenia’s defense potential is significantly enhanced by Russia through being part of the CSTO, and the Customs Union membership will ensure cheaper gas prices. Additionally, the majority of Armenia’s infrastructure and industry are owned by Russian state companies. Russia’s support of Armenia, and thus indirectly of the Nagorno-Karabakh conflict, takes it out of the list of pretenders to assist with regional cooperation. Russia’s main interest is keeping its remaining bastion in the South Caucasus in opposition to NATO encroachment. Cooperation in the South Caucasus does not seem to be one of Russia’s priorities, demonstrated by the fact that it is supplying arms to both sides of the conflict. In the face of growing water scarcity, the sharing of transboundary water resources raises concerns of national security for the riparian states, and simultaneously creates opportunities for cooperation. Regional cooperation over the water resources of the Kura-Aras Basin may set the framework for comprehensive management of water resources in the South Caucasus, and lead to a peaceful environment in the region. The development of strategic incentives, and estimations of economic benefits for the upstream and downstream countries, could initiate changes in the relations of the conflicting parties. At this point in time the three riparian states in the region are likely to oppose the creation of a basin-wide authority, approaching the urgent problem of pollution through narrowly-focused agreements of more immediate benefit. Such agreements can specifically focus on the reduction of organic, nutrient, and hazardous substance pollution loads entering the basin. Distrust may eventually be replaced by efforts to solve common problems and a tradition of cooperation. The most promising programs include implementation of a regional water resources information system for the purposes of data exchange, and the development of an early warning system for natural disasters. These are also the most realistic options given the geopolitical situation in the region. The first step in any water resource planning is effective monitoring of water usage in the basins. Some technical-level work has already been undertaken through the NATO-OSCE South Caucasus River Monitoring Project, which ended in 2009. Such programs provide access to reliable quality data both locally and regionally. The information exchange has the power to strengthen cooperation by contributing to mutual trust, joint assessment, and policy-making. The data gathered could eventually be used for a creation of a basin treaty. Additionally, knowledge sharing and increased cooperation lower the risk of conflict and may later diffuse to upper levels of governments. Lack of technical-level expertise and of newer equipment and facilities stand as an impediment to implementation of such programs, necessitating the involvement of the international community. The European Union (EU) is well-positioned to both continue investing in the time-consuming regional cooperation building process, and providing technical experts, particularly given their experience with effective international cooperation on clean-up and water management of the Danube and Rhine River Basins. With the South Caucasus being a key export route for oil and gas from the pre-Caspian region, the EU is interested in lessening its energy dependence on Russia. Correspondingly, Azerbaijan is interested in promoting deeper energy cooperation with the EU. Azerbaijan is in a unique position to attract and leverage investment from the international community. It has already invested in making improvements to its water resource management, and has the necessary ties to the international community for further engagement. The main struggle consists of overcoming strategic impediments to cooperation consisting of the Nagorno-Karabakh conflict, and of placing greater value on the well-being of the region’s populace. Svetlana Valieva is a Research Fellow at the Center for Climate and Security, and an international development professional at the World Bank. By Caitlin Werrell and Francesco Femia in climate and security on November 28, 2013 .